If you have any questions about the Daemon 75s information page below please contact us. The lovely 2012 motor yacht Daemon 75s represents the 'S' version of the Daemon 75 yacht, the first model in the open line by Filippetti Yacht. Designed by Luiz de Basto, luxury yacht Daemon 75s mixes up power with comfort and light throughout the vessel, featuring a blend of technologically advanced solutions, high-tech furnishings and natural materials, enhanced by the finest of woods. Daemon 75s by Filippetti Yacht provides luxurious accommodation in 2 cabins. In addition, there is one crew cabin, sleeping the vessel's highly trained crew. Luxury yacht Daemon 75s is powered by twin 1,948 hp MTU 12V 2000 M94 diesel engines, delivering her an impressive top speed of 50 knots and a cruising speed of 43 knots. Daemon 75s has a maximum beam of 5,32m and a draft of 1,19m, fully loaded. 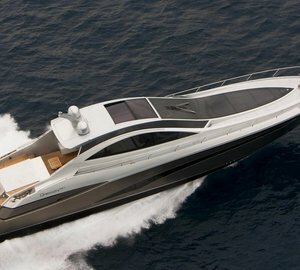 Filippetti luxury yacht Daemon 75s features luxurious accommodation divided into 2 lovely cabins. The vessel's friendly and dedicated crew sleep in one crew cabin. We do have available further amenity, owner and price information for the 23.85m yacht Daemon 75s, so please enquire for more information. The luxury yacht Daemon 75s displayed on this page is merely informational and she is not necessarily available for yacht charter or for sale, nor is she represented or marketed in anyway by CharterWorld. This web page and the superyacht information contained herein is not contractual. All yacht specifications and informations are displayed in good faith but CharterWorld does not warrant or assume any legal liability or responsibility for the current accuracy, completeness, validity, or usefulness of any superyacht information and/or images displayed. All boat information is subject to change without prior notice and may not be current.